The Center for Arts and Public Engagement recently announced that the Yoknapatawpha Arts Council is one of three sites selected for the In-State Residency Program. On Saturday, the public is invited to meet Mississippi artist Daniel Johnson to learn about his work and begin the collaborative process that will contribute to this unfolding participatory artwork. 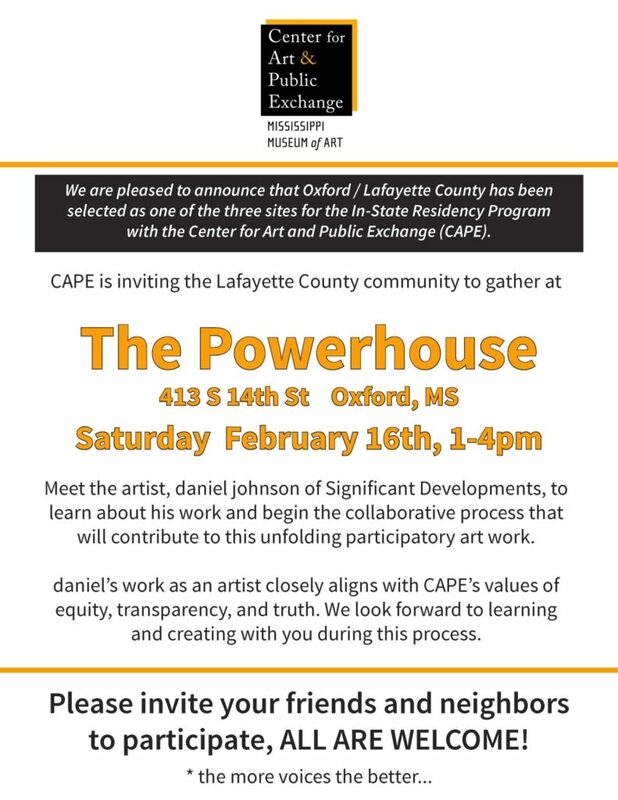 Last year, CAPE held listening sessions across the state, including Oxford, to discover what the art community thinks are the challenges and opportunities facing Mississippi. CAPE created core issues in the state and are providing grants to artists to develop participatory events that help to address those issues and build a public artwork project. Oxford has secured one of the projects and is working with Johnson to create a public artwork project. Johnson will be discussing his concept from 1 to 4 p.m. at The Powerhouse Saturday and community input is encouraged. The event is free and open to the public. The Center for Arts and Public Exchange is an initiative by the Mississippi Museum of Art and funded by the W.K. Kellogg Foundation.